The Hippodrome midgets had a May party in Central Park yesterday morning. The celebration didn't take you much space on the grounds, not because the midgets were small, but because the people who wanted to see them were so many. "Oh-o-o-o-o, little girls dressed up for ladies!" cried one small boy with wild delight, and that was the way most of the people in the Park felt about it and they gathered around to see. The police tried to hold them back, but it was not until a space was roped in that the crowd could be kept from extending over the boundary line. 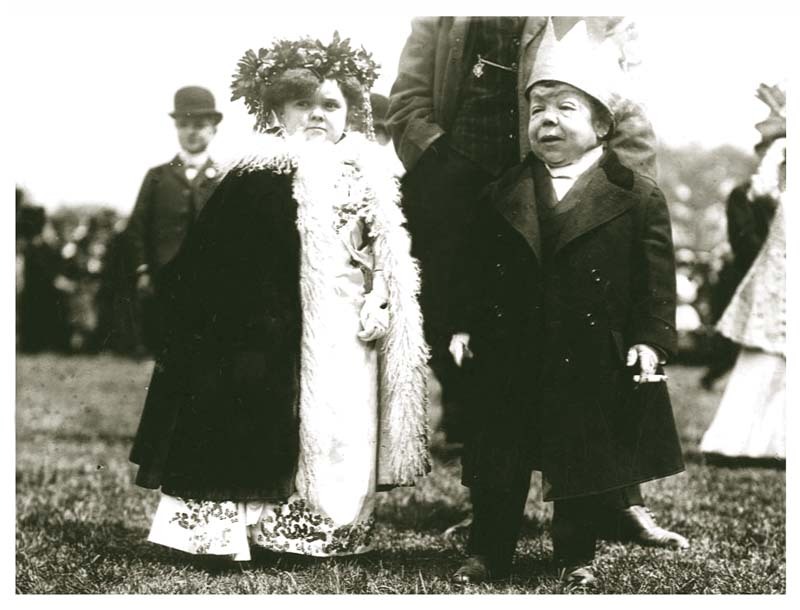 It was no wonder, for there was never such a May party seen in Central Park before or such as May king and queen. Marceline Jr., was the King, and Queen Anita’s last name is Melser. Marceline is the clown of the midget circus and he takes his name from the real clown Marceline of the Hippodrome stage. The is all right on the stage but yesterday’s midget May king was much more than that. He was a king, all the thirty four inches of him. Marceline, Jr., is also known as the Turkish Tom Thumb; his real Turkish name is Hagaddi and he acknowledges to nearly 60 years, and looks it. King Hagaddi wore citizen’s clothes yesterday, after the manner of modern kings, with a smart little overcoat fitted at the back. With this he wore a crown of massive gold in high points. But it was his general appearance which proclaimed his Majesty. The King of today is a well-fed, prosperous-looking person, and if his face is strongly lined it shows that he has seen life as a King should, and that is a portrait of King Hagddi. He smoked the cigarette lie held in his pudgy little hand with a bored indifference, and if he thought great though he kept them to himself as a King may. Asked if he enjoyed the day, a question even a King may be asked, he responded in a monosyllable, “Goot,” which means that he has been associated with German ladies and gentlemen lately, even Queen Anita being a German, and he has courteously accepted her accent. Queen Anita is only 23 years old and thirty-two inches high. She was the belle of the May party, and she knew it. Her manner ranged from the coldly haughty to coquettish. To outsiders she was haughty, but to the small gentlemen of her own party and some of the larger ones she distinctly made eyes. She waved her small hands shook a tiny fore-finger, and gave sprightly little kicks now and then with a miniature foot. The queen wore a magnificent décolleté white gown, spangled and jeweled, her crown was of yellow sunflowers, and her mantle of red velvet trimmed with white fur. Queen Anita has really a grievance, which accounts for her hauteur to strangers. She is a young lady, she says not a child, and she objects strongly to being patted on the head and having her arms squeezed by people who want to know if she really is not a big waling doll. There were four maids of honor and they were only less beautiful than the queen. They were four little maids in blue, tiny little creatures, in trained close-fitting dark blue cloth frocks, the trains pinned up over their round little hips as they danced around the May pole. Each wore a big hat tipped back from her face by a big pink rose, and they were most attentive to the queen, seeing that she did not take could from wearing her low-necked frock and was not too warm wearing her heavy mantle. The most handsomely dressed little woman in the midget party was Mrs. George Laible. Mrs. Laible was the May Party chaperone, for she acknowledged to being the one married woman of the party, and there is not a clubwoman in New York better dressed. Mrs. Laible wore a handsome pale tan carriage dress and a hat to match, a smart little suit. Mr. Laible was also smartly clad, and wore a which waistcoat. Mr. and Mrs. Laible are very little people. Perhaps not quite as tiny as Queen Anita-and Mrs. Laible has been in professional life for twenty-five years, while her husband goes her five years better. They have been married fifteen years, and will celebrate their wedding anniversary on May 23. Mrs. Laible does not mind confessing all this and all it means. “I don’t think women mind telling their ages now as much as the did,” she says. She is very well read, takes a morning paper every day, is much concerned over the death of King Edward, but she doesn’t think much of woman suffrage. The procession was as interesting as anything about the May party. The midgets drove up to the Park in their own equipages, King Hagaddi and Queen Anita in a crystal and gold coach imported from France, while little Ludwig Schmitt, who is the tiniest of all the midgets, the smallest midget ever known, sat in the box of a hansom cab just his size, and drove all the way. The procession was due to start from the Hippodrome at 9:05 when a tiny little man came hurrying up, his overcoat-on his arm, and his face having the hurried, “in need of a shave: look. The early comers shook their heads at him reproachfully, but he pulled a tiny gold watch from a tiny waistcoat pocket, and from somewhere in the tiny depths of the tiny man’s interior came what would have been a deep bass voice if it had not been such a little one, and a tiny croak said that by his watch it was just 9 o’clock. The May party was a great success Except that it could not spread out, because all the other May parties, including some wild Indian warriors in khaki and feather headdresses had come to look on, there were all the regular May party features. There were sandwiches cut in midget size-though secretly it is whispered that the little people have grown-up appetites-cake and ice cream and lemonade. After the Maypole dance the little ladies and gentlemen waltzed together and the little Burmese gentleman. Who is one of the tiniest of them all, and a fine pole performer in the circus, walked around with great dignity because he sported the only tall hat in the crown. He also wore a bangle bracelet on one tiny dark-skinned wrist.